Wire Mesh Decking is a highly versatile shelving and decking solution offering significant benefits over traditional shelving, for both Fire and Safety regulations. 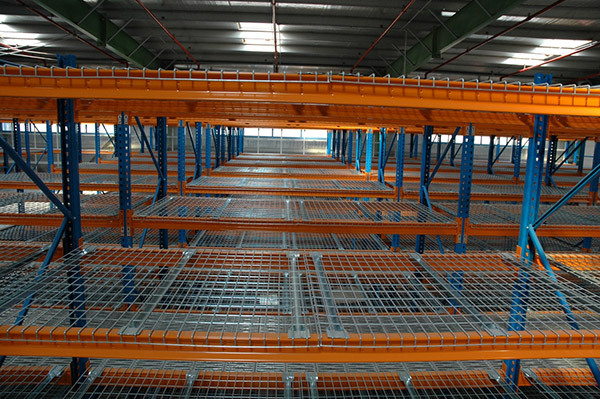 It quickly converts pallet racking into shelving for smaller items without a loss in loading capacity. Each wire mesh panel is quickly positioned between two pallet racking box beams, creating an instant shelf for small boxed items or irregular sized palletised goods. Each panel is manufactured from steel wire mesh, with three flared channels for strength and held in place by the “waterfall” design of the front and back edges. To ensure resilience and prevent rusting each mesh panel is coated in a grey, highly durable, paint finish. or 1 5/8” step beams. for food storage and other clean applications.